A study of some of the plays rendered into Kannada in the days of the colonial rule would offer tangible evidence for some of the adventurous ideas about translation as a distinct mode of creative writing. 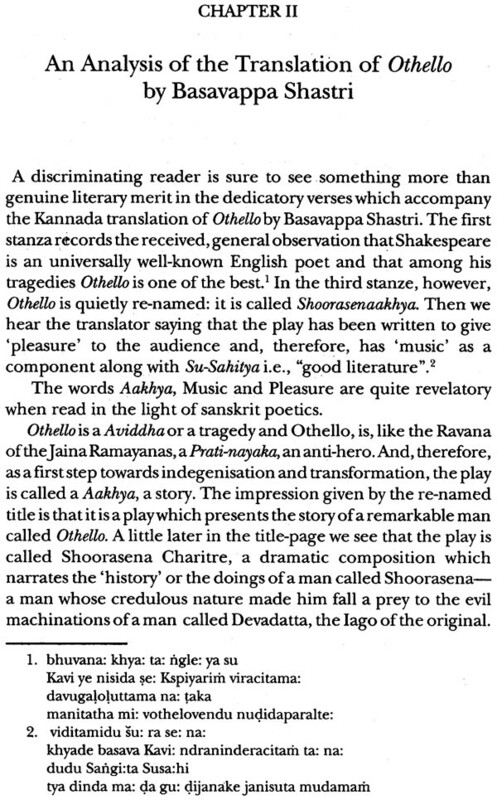 The analyses of the Kannada plays offered in this small book claim that "to translate a text is to interpret it and sit in judgement over it". The various translations and adaptations of the Bible, Shakespeare, Henry Fielding and Walter Scott in Kannada simultaneously offer and evaluate the culture of the English speaking world and, therefore, what ought to interest us in our study is not the fidelity to but the departures from the original texts. 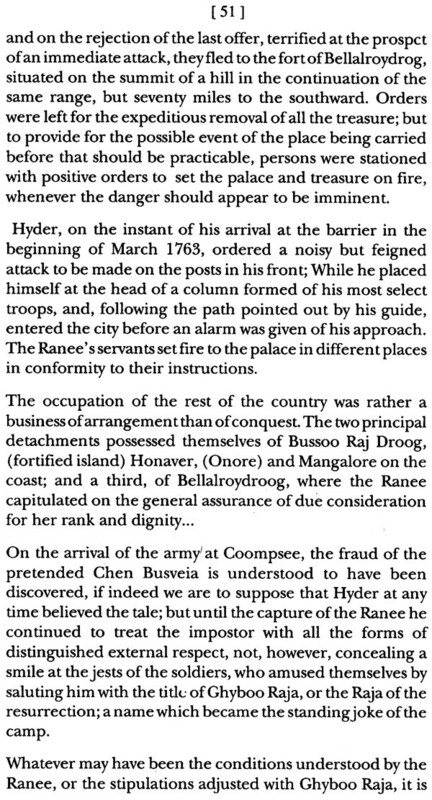 It is the assimilations, the rejections and the modifications that need to be paid special attention as these present the very process of a creative give-and-take of a cross cultural interaction between two different peoples of two different nations- here between the Kannada speaking and the English speaking peoples. D.A. SHANKAR, was educated at the universities of Mysore and Sheffield, U'K, Some time U.G.C. Research Fellow, British Council Scholar, Post-doctoral Fellow at the University of British Columbia, Canada, and Fellow at the Indian Institute of Advanced Study, Shimla Dr. Shankar was until recently a Professor of English at the University of Mysore. Apart from numerous contributions to journals and Periodicals, his publications include Cleanth Brooks: an assessment, Readings and Re-readings (essays in American and Commonwealth Literatures), Appropriating Shakespeare and Carvalho-a translation of the Central Sahitya Akademi award-winning Kannada novel. A poet and critic in Kannada, Professor Shankar has to his credit Nimmallobba and Pavada (collections of poems), Karibhanta (a collection of plays) and Nirvahane and vastu Vinyasa (collections of essays in Literary criticism). 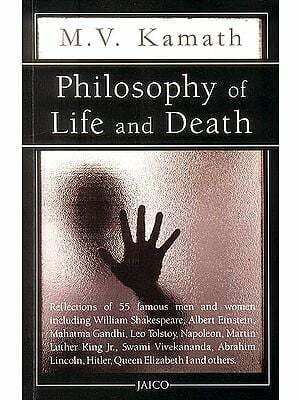 Among his much reprinted translations may be mentioned Albert Camus's The Outsider, Voltaire's Candide, Mulk Raj Anand's Untouchable and Vidyapati's Purusha Parikshe and Tolstoy's non-fictional prose. He has besides edited a volume of essays Vyakti-Abivyakti in honour of Chaduranga. Dr. Shankar is currently Visiting Professor of English at the University of Mangalore. When I was at the Indian Institute of Advanced Study, Shimla, on a Fellowship between 1993-94 I began working on a project I had rather grandly titled: 'Translations and Adaptations as Creative Agents of Cross-Cultural Interaction". It did not take me long to realize that it was something I would not be able to complete in any specified, time-bound frame and I, therefore, thought of focusing my attention on a narrower, better-defined area in the same field. A study of some of the plays rendered into Kannada in the days of the Colonial rule, it appeared to me, would offer tangible evidence to some of my adventurous ideas about translation as a distinct mode of creative writing. 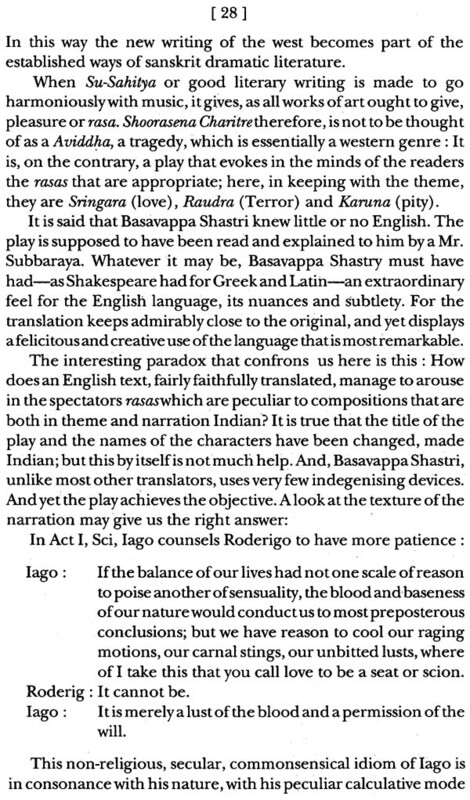 It is in fact the analyses of the Kannada plays offered here which have prompted me to claim that "to translate a text is to interpret it and sit in judgement over it." In August 1993 - the year I took up my Fellowship-it was the distinguished historian Prof G.S. Grewal who was the Director of the Institute, and when I left it 1994, it was the distinguished philosopher Prof. M. Miri who had taken over the Directorship of the Institute. I am grateful to both the Directors and to Prof. S. Gopal, the Chairman of the Governing Council of the Institute, who made it possible for me to work on this project. I t is with pleasure that I recall the academic and administrative help I so constantly received from Mr. S.A. Jabbar, who in the course of a year's time became a dear friend, too. I owe special thanks to the staff of the marvellous library, and in particular to Mrs Alekha, the Deputy Librarian. Before I close I should like to strike a personal note only to say that in Professor Miri I found a genial philosopher - 'genial' in its rare as well as in its current sense --on whom I could count in any kind of crisis, small or big. I am grateful for many kindnesses I have received from him. I cannot really conclude this preface without gratefully re-calling the warm affection Mrs and Prof Randhir Singh, Mrs and Prof K. Raghavendra Rao, Mrs and Mr. Dhillon, Mrs and Dr. Prem Singh, Dr. D.R. Nagaraj, Dr (Mrs) Tripta Vahi, Dr (Ms) Papiya Ghosh and other Fellows generously gave me. I am thankful to them all. Translations and adaptations of texts of a culture other than one's own are perhaps not to be understood in purely literary terms. In fact, it is possible to argue that a literary evaluation of these is irrelevant and often of dubious significance. What one needs to be supremely aware of is the fact that translations and adaptations are major attempts on the part of one culture to come to terms with another and that this is especially so when the other culture happens to be, for a complex of reasons, a dominant culture as the British culture was during the last decades of 19th and the early decades of 20th century. The various translations and adaptations of the Bible, Shakespeare, Henry Fielding and Walter Scott in Kannada simultaneously offer and evaluate the culture of the English- speaking world and, therefore, what ought to interest us in our study is not the fidelity to but the departures from the original texts. It is the assimilations, the rejections and the modifications that need to be paid special attention as these present the very process of a creative give-and-take of a cross cultural interaction between two different peoples of two different nations-here between the Kannada speaking and the English speaking peoples. This of course is not to deny that important literary aspects also emerge and accompany the process of interaction: they do, and they need to be seriously considered. It is often strangely assumed that translation is simply a question of individual choice and taste, that it is an activity which is only peripherally related to the main body of the literature of a nation, and that socio-cultural determinants have little or no decisive role in directing or moulding it. In fact, nothing can be farther than the truth. Not only does not translation take place in a vacuum, it occupies centre-stage and sets in motion -it could be said without any exaggeration- the general movement of thought of a nation. It defines the form in which an alien culture can enter the indigenous and sets boundaries which the incoming culture-texts would cross only at their peril. Perhaps, translation, its health, is the only true index of the strength and weakness of a given race, language and culture. And, these, singly or together, often profoundly, get influenced by what happens in the area of translation. In our own day we have the example of Ezra Pound. His translations of the Chinese poets brought in to being not only a new idiom and a form but succeeded in radically affecting the attitude of a whole generation of writers to reality. 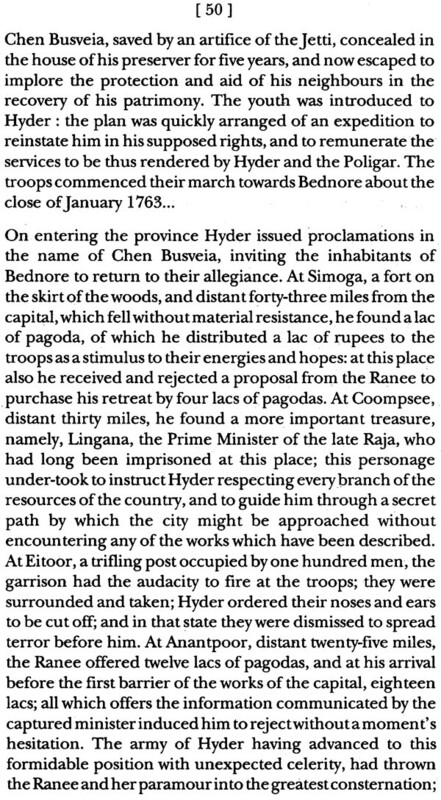 A similar phenomenon was witnessed in Kannada in the early decades of this century when B.M. Srikantaiah presented the Kannada reading public his translation of English poems in English Geethegalu which showed the direction in which his contemporary poets were to move. By implication, then, it means that every culture consciously or unconsciously regards translation as an agent which brings home both power and knowledge-power tapped from sources other than the indigenous, and, therefore, of a fresh kind-and both are brought in a manner and a quantum that would benefit the receiving culture. In this process the socio-cultural attitudes, largely determined by history and by politico-economic position, get invariably reflected: these, in fact, decisively tell on the attitude the translator brings to his-material. really do want a little Art to shape them. Fitzgerald, a product of the Imperial England of the early decades of 20 century, could certainly afford to display such a supercilious attitude. He obviously thought that the Persian poems- part of the colonized world-were rough diamonds which properly cut and polished would add the right kind of lustre to the British Crown. Deep down it is possible he thought that Omar Khayyam would make an agreeable companion to his outwardly worldweary Victorian friends. Added to this, the text may have appeared innocuous and in no way likely to threaten his cultural identity. I have suppressed English customs where they may appear shocking to other nations, or else made them conform to customs prevalent in the rest of Europe. It seemed to me that those remainders of the old and uncouth British ways, which, only habit prevents the British themselves from noticing, would dishonour a book in which manners should be noble and virtuous.